The average cost for a steel mini storage building ranges between $25 and $40 per square foot. That price includes the complete assembly kit and materials, foundation, delivery, and installation/construction of the building. Electrical, plumbing, insulation, and customizations could add another $20 to $40 per square foot. A multi-story building may cost as much as $70 per square foot. One of the biggest factors affecting the cost of a commercial steel building is whether you choose a single- or multi-story construction. Details, design, and utilities also impact cost. The following estimates do not include land or site improvements. The average price of a single-story steel storage building is between $25 and $40 per square foot. The average price of a multi-story steel storage building is between $42 and $70 per square foot. A steel building measuring 20' x 80' x 8.5' that holds 16 units measuring 10' x 10' costs around $26,000 on average. A building measuring 25' x 130' x 8.5' that contains 12 units measuring 10' x 15', 12 units measuring 10' x 10', and five measuring 5' x 10' averages around $42,000. For a steel storage building measuring 40' x 200' x 8.5 overall and units measuring 10' x 30' (9), 10' x 20' (18), 10' x 10' (9), and 4' x 7' (16), the average price is around $70,000. 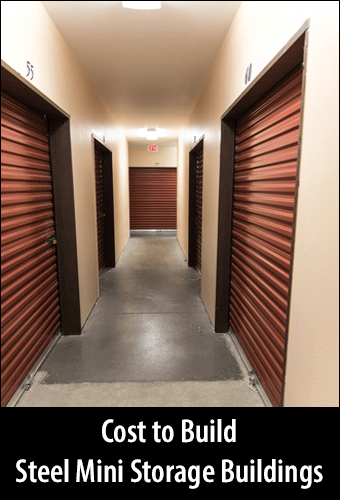 These prices do not include a security system for your storage facility. These vary widely in cost. Check out our page on video surveillance systems for full details. When it comes to the building itself, one of the bigger variables is the price of steel, which fluctuates dramatically sometimes. Politics played a large role in U.S. steel prices since 2017. Forecasts for 2019 indicate a stabilization in the market. However, don't expect a price quote to be good for more than 3 to 6 months. Poured concrete foundation ranges from $4 to $7 per square foot. Labor costs vary according to location and average salaries in your area but average between $2 and $6 per square foot. Insulation ranges from around $0.40 to $2 per square foot, depending on the type. Land costs between $1.25 and $3.25 per square foot with location (urban vs suburban vs rural) playing a large role in determining cost. 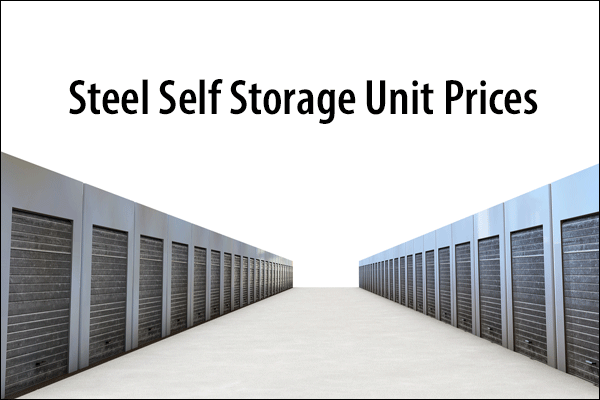 Customization and add-ons increase the price of your steel storage building. Popular options include solar panels, windows, skylights, vehicle and walk doors, and finishing options such as stucco and brick. When it comes to land for your facility, you typically use less than half of it for the building itself. The rest is driveways, walkways, parking, office space, etc. Buying land for your steel mini storage building typically accounts for around one-quarter to one-third of your total development cost. That total does not include site prep and excavation. Before purchasing your steel storage building, do plenty of research. What are the building codes in the area where you plan to operate? You definitely don't want to buy land before knowing whether you can erect your mini storage units. Look carefully at price quotes, too. If one vendor comes in with a bid that's drastically lower than the competition, ask yourself why. It could be a contractor launching a new business and therefore offering killer deals. Usually, though, you get what you pay for. Compare line items carefully to make sure you're comparing apples to apples, not oranges. You may also save on labor costs if you build during what is traditionally considered a slow season in your area. If buying directly from a manufacturer, make sure the company has accreditation from the International Accreditation Service. You want the best building and quality available. This also means you should know when cost cuts make sense, and when pinching your pennies isn't the best idea. Finally, get everything in writing before allowing anyone to deliver materials or start building. This is the only way to make sure you actually get what you're buying.